The Clement Canopy at Clementi Avenue 1 is a new launch condominium by UOL and Singapore Land. 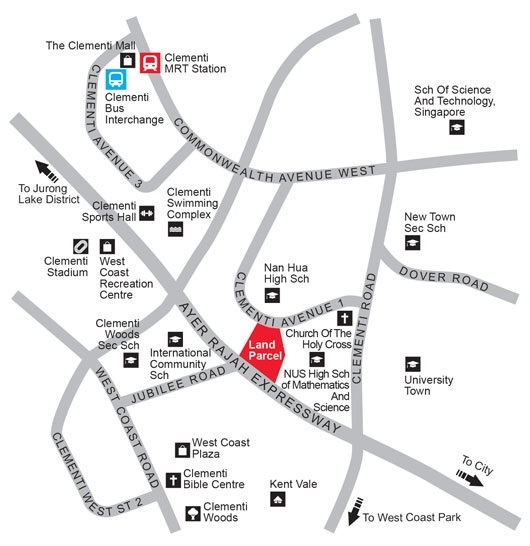 The 1.3ha site in Clementi Avenue 1 is near amenities such as West Coast Plaza, a wet market and several reputable schools. The Clement Canopy condominium proximity to Science Park, National University Hospital, National University of Singapore and other prestigious schools will draw interest from investors as there is a scarcity of sites with such attributes. The developer is expected to build two 40-storey towers with about 500 units in all, capitalising on the extensive views to the south. The Clementi Avenue 1 condo is conveniently linked to Ayer Rajah Expressway (AYE) and Clementi Road, providing easy access to the city centre and the Jurong Lake District. Future residents can also enjoy recreational facilities at Clementi Sports Hall, which is within walking distance. Residents will also have easy access to retail and leisure amenities in the nearby Jurong Lake District, which is just one station away from Clementi MRT station. For more information on The Clement Canopy, simply fill up your details below and our salesperson will get in touch with you shortly!